So here we go again - another item that I've officially added to my wish list. I would use the word "need," but that's just not true. I'm going to be honest - I just want this. I have a feeling I know where my desire for this is coming from. With Valentine's Day just around the corner, many food bloggers have added special desserts to celebrate this romantic holiday. I found this recipe for Red Velvet Cheesecake the other day (it was originally posted last year), and I've been craving it ever since. If only I had a springform pan, so I could whip this up...then eat it...all of it. Let's get to the specifics. 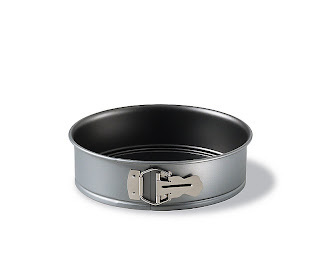 I want this Calphalon one, as all my other bakeware is Calphalon. Well, all of it except my cookie sheets - those are AirBake - and they make the best cookies. Anyway, here's the pan - it's a beauty, isn't it? !